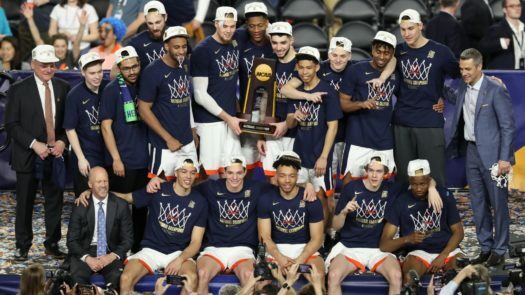 On April 8, 2019, University of Virginia and Texas Tech University will square of for the NCAA Championship. Throughout March and April, college teams have been facing each other in a bracket style tournament called March Madness. Each team has gone through a rigorous path to the championship. In round one of the bracket Virginia beat G-Webb 71-56, then in round two Virginia won against Oklahoma 63-51. In the Sweet Sixteen Virginia beat Oregon 53-49, in the Elite Eight Virginia beat the number 3 seed of Purdue 80-75. They then beat number 5 seed Auburn 63-62 of a controversial no-call on a double-dribble to get sent to the National Championship. Texas Tech had a harder time getting to the championship game compared to Virginia. They beat Northern Kentucky in the first round 72-57, ten they beat Buffalo 78-58 in the second round. In the Sweet Sixteen they beat number two Michigan 63-48. In the Elite Eight Texas Tech beat number one ranked Gonzaga 75-69, then in the Final Four they beat Michigan State 61-51. In the Championship game they were set to face Virginia. This past Monday the two teams squared off in a thrilling battle for the championship. The two teams went to overtime and Virginia had the edge on them and won it 85-77. This championship was everything fans could have asked for. Junior George Khawam said this about the game, ” this was an extremely good game, I was on my toes the whole time.” This was the first time that Virginia went to the National Championship and Texas Tech go to the National Championship. That is the first time that either team has its first appearance. This was Virginia’s first Championship. The game had a special guest in Texas Tech alumni and NFL MVP Patrick Mahomes. Mahomes was the tenth pick in the 2017 NFL Draft and was sent to the Kansas City Chiefs. It was a tough loss but he still has multiple awards to sit back on.